Ukrainian President Petro Poroshenko announced Monday that Ukraine will begin discussions with the North Atlantic Treaty Organization on the Membership Action Plan (MAP). 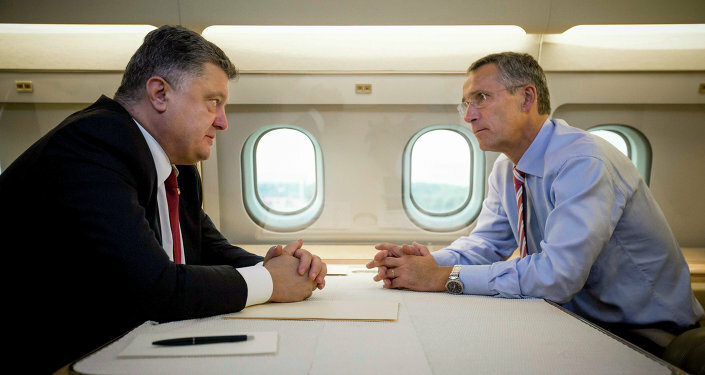 "Ukraine has clearly defined its political future and its future in the sphere of security," Poroshenko told reporters while standing alongside Stoltenberg. "Today we clearly stated that we would begin a discussion about a membership action plan and our proposals for such a discussion were accepted with pleasure." However, observers express doubts regarding Ukraine's NATO membership, and with good reason. Immediately after the collapse of the Soviet Union, the military bloc made a series of steps aimed at bringing the newly independent Ukraine into its fold. 20 years ago, on July 9, 1997 Kiev signed the Charter on a Distinctive Partnership, which established the NATO-Ukraine Commission (NUC). The charter envisaged building an "enhanced NATO-Ukraine relationship," including military cooperation and consultations. "NATO and Ukraine will base their relationship on the principles, obligations and commitments under international law and international instruments, including the United Nations Charter, the Helsinki Final Act and subsequent OSCE documents," the document said. Although Kiev regarded the document as the first step on the path to membership in the alliance, the charter didn't oblige the bloc to accept Ukraine as a full member in the future. Furthermore, the Ukrainian leadership had repeatedly changed its mind about the country's integration into the alliance. For instance, back in June 2004 then Ukrainian President Leonid Kuchma introduced an amendment in the country's military doctrine which proclaimed Ukraine's NATO membership as a strategic goal. A month later, Kuchma revoked this offer following his meeting with Russian President Vladimir Putin. Then, in April 2005 Viktor Yushchenko, the third president of Ukraine, returned the amendment into the Ukraine's military doctrine, and in January 2006 Kiev gained the support of Hungary, the Czech Republic, Poland and Slovakia for Ukraine's full NATO membership. However, Yushchenko didn't make any significant progress on this path. Although the Ukrainian president appealed for the implementation of NATO's Membership Action Plan (MAP) in 2008, France, Germany, Italy, Spain, Portugal, Belgium, the Netherlands went up against Ukraine and Georgia's integration into the bloc. In an apparent effort to downplay the embarrassing situation NATO promised the potential candidates that they would become members of the alliance when they meet the required standards. Thus, on August 21, 2009, Kiev signed the Declaration to Complement the NATO-Ukraine Charter, "to underpin Ukraine's efforts to take forward reforms aimed at implementing Euro-Atlantic standards," the bloc's official site says. However, Yushchenko's successor, Viktor Yanukovich, didn't facilitate the process of Ukraine's accession to NATO, being committed to the country's non-alignment principle, proclaimed by the Supreme Council of the Ukrainian Soviet Republic on July 16, 1990. Needless to say, the February coup of 2014 upset the established balance of power. Following the coup the new Ukrainian leadership signaled its willingness to enter the Western military alliance. For his part, Jens Stoltenberg, the 13th Secretary General of the North Atlantic Treaty Organization, has repeatedly endorsed Kiev's efforts comply with the bloc's standards. Meanwhile, in February 2017, Ukrainian President Poroshenko pledged to hold a referendum on the country's NATO membership. However, there are insurmountable obstacles in Kiev's way to the alliance. A country can join the bloc only if it has no territorial disputes and armed conflicts, both internal and external. In this context the Kiev-led military campaign against Donbass has dealt a heavy blow to Ukraine's NATO aspirations. Speaking to RT, Russian military analyst and commercial director for Arsenal of the Fatherland magazine Alexei Leonkov underscored that the much discussed NATO standards won't transform the Ukrainian army into a capable military force. "The proverbial NATO standards which are being implemented by the Ukrainian Ministry of Defense are effective in name only. Judging from the example of Eastern Europe, we can conclude that Ukraine won't receive new weapons for free, and it doesn't have enough money to buy them," Leonkov said. Ukraine's National Guard soldiers during combat training developed by NATO at a training ground in the Zolochevsky District, Lviv Region. 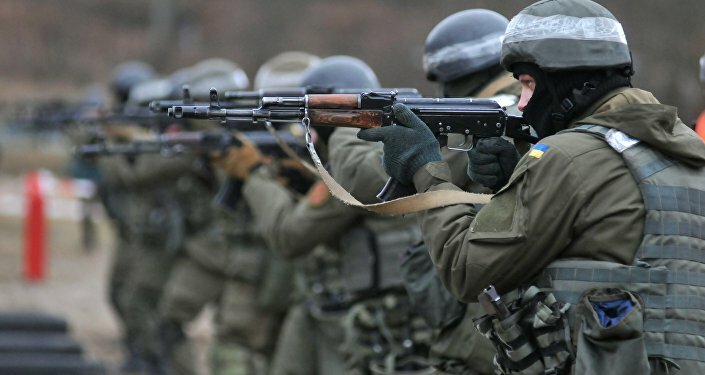 "Kiev very much hopes to mooch off the West, believing that its 'friends' will supply it with money, the best weapon and will teach them how to fight well," the military expert emphasized. "But in the end Ukraine will pay for everything," Leonkov stressed, "[Ukraine's] transition to [NATO] standards will only completely hammer the final nail in the coffin of the Ukrainian defense industry." As for NATO's Membership Action Plan, which is currently being discussed by Kiev and the alliance, it, again, doesn't provide any guarantees for full membership to the bloc for Ukraine. "The Membership Action Plan (MAP) is a NATO program of advice, assistance and practical support tailored to the individual needs of countries wishing to join the Alliance. Participation in the MAP does not prejudge any decision by the Alliance on future membership," NATO's official website reads.